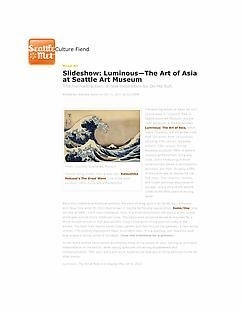 The next big exhibit of Asian art isn’t tucked away in Volunteer Park at Seattle Asian Art Museum—it’s the main attraction at SAM Downtown. Luminous: The Art of Asia, which opens Thursday, will showcase more than 160 works from 13 countries, including 17th-century Japanese screens, 13th-century bronze Nepalese sculpture, MRIs of ancient religious artifacts from China and India, and a smattering of more contemporary pieces in photography, porcelain, and fiber. Roughly a fifth of the pieces are on display for the first time—Thai ceramics, textiles, and Indian paintings discovered in storage—and a third of the exhibit comes home after years of touring Japan. Amid this collection of historical artifacts, the most striking work is by Do-Ho Suh, a Korean-born New York artist (b.1962) best known in Seattle for his dog-tag sculpture Some/One (also on view at SAM). Suh’s new installation, Gate, is a three-dimensional silk replica of the ornate stone gate outside Suh’s childhood home. The translucent sculpture serves as a screen for a three-minute animation that appropriates images from some of the seminal works in the exhibit. The flock from nearby panel Crows gathers and flies through the gateway; a faun strolls in from 17th-century masterpiece Poem Scroll With Deer. It is a startling, sad, beautiful work that evokes a strong sense of nostalgia. Do-Ho Suh’s written observations accompany many of the pieces on view, serving as a modern interpretation of the exhibit, while raising questions concerning displacement and contextualization. That said, Suh’s own work might be the best way to bring attention to the far older pieces.